From Hell Week to hell on earth, they go where no one else dares, kill with precision, and pull off daring attack, rescue, and reconnaissance missions. What kind of man becomes a secret warrior—a Navy SEAL, Delta Force ranger, Army Green Beret, or Air Force special op pilot? For the first time, veteran Newsweek reporter Douglas Waller takes you inside this secret, elite world, from the SEALs’ legendary Hell Week, where trainees get four hours of sleep in five days of body-and-mind-breaking drills—to an electronics-jammed Pave Low, the most sophisticated helicopter in the world. Then he follows the Commandos into the action—in never-before-revealed Desert Storm battle scenes, where U.S. Special Forces waged Scud-busting night missions, behind-the-lines firefights, and some of the most unconventional and dangerous missions in the history of war. Douglas C. Waller is a lecturer, author, and veteran correspondent. Before joining Newsweek in 1988, he worked as a legislative assistant for Senator William Proxmire and Representative Edward J. Markey. From 1994 to 2007, Waller served in Time magazine’s Washington bureau as a correspondent. 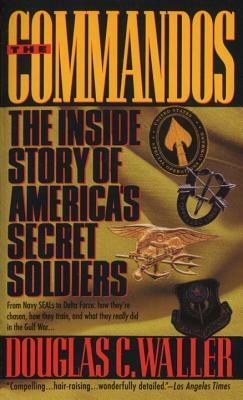 He has authored or coauthored nine books including The Commandos: The Inside Story of America’s Secret Soldiers and Wild Bill Donovan: The Spymaster Who Created the OSS and Modern American Espionage. Waller earned a BA in English from Wake Forest University and an MA in urban administration from the University of North Carolina at Charlotte. He lives in Raleigh, North Carolina, with his wife, Judy.